A growing number of Indigenous artists in Winnipeg are creating large scale, public art pieces to "indigenize" the city and reclaim space at the same time. When Annie Beach was growing up in a suburb in north Winnipeg, she didn't see Indigenous art in public spaces on her way to school. 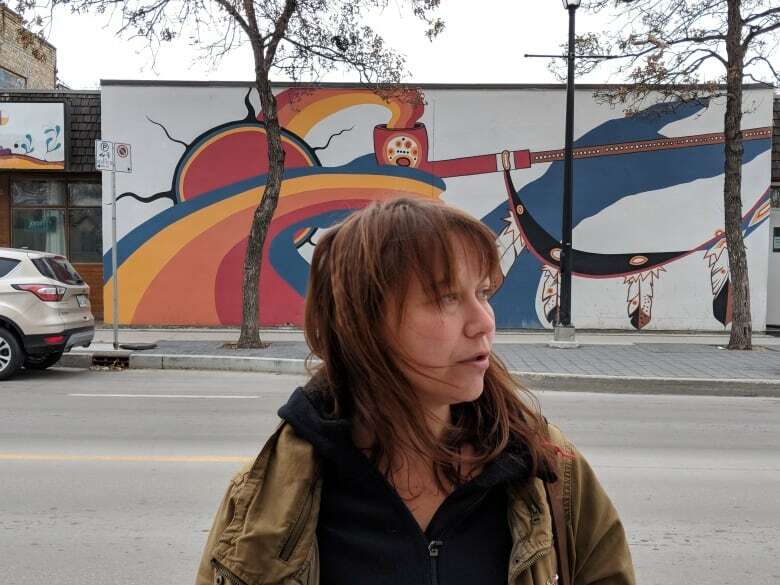 But over the past few years, ​she has created 10 public art murals in Winnipeg's inner city, with the latest project being a massive starblanket mural at the University of Winnipeg's Wii Chii Waakanak Learning Centre on Ellice Ave. The project was finished this summer, in collaboration with Kenneth Lavallee and Synonym Art Consultation. 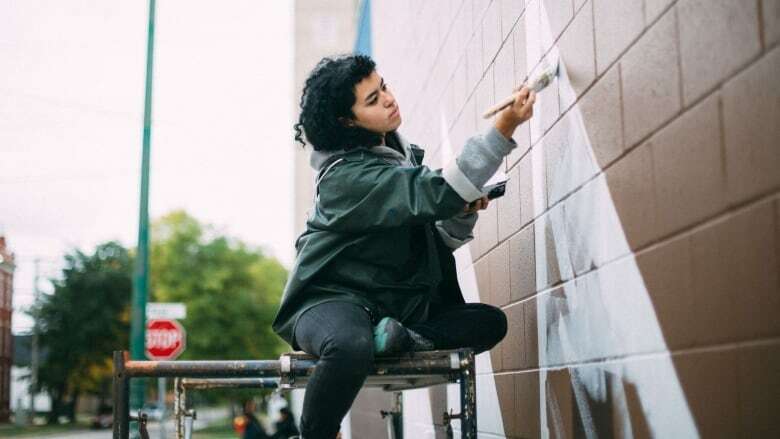 She is one of a growing number of Indigenous artists in Winnipeg creating large scale, public art pieces to "indigenize" the city and reclaim space at the same time. "Art is such a prominent part of Indigenous culture," said Beach, who is from Peguis First Nation, and is in her fourth and final year of a fine arts degree at the University of Manitoba. 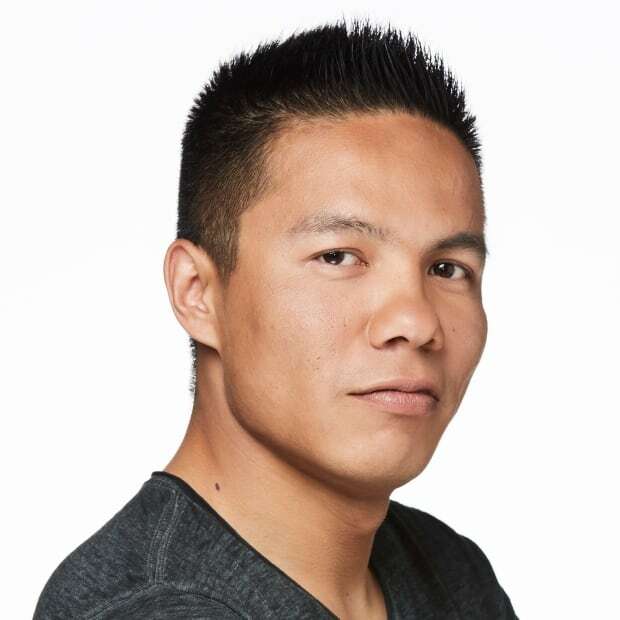 "There's so much blatant racism that [Indigenous people] experience on the streets of Winnipeg and [art] gives them a sense of pride." For Beach, these murals represent the history of Indigenous Peoples in the city, and give artists an opportunity to beautify their community. When she was younger, she remembers other Indigenous youth being ashamed of their ancestry. She said public art gives Indigenous youth a boost of confidence when they see themselves reflected through various art media. "They can pass by it in their neighborhood or on their way to school and they can see this Indigenous art, symbolism, or imagery ... and they can recognize that and feel a little more sense of belonging." Directly across the street from the starblanket mural, is a 9.8 metre by 7.6 metre recreation of an artwork by Daphne Odjig called Thunderbird Woman. Thunderbird Womanwas curated by Jaimie Isaac and was also commissioned by the Synonym Art Consultation Wall-to-Wall Mural and Culture Festival. The starblanket project at Wii Chii Waakanak is one of five murals in the inner city where starblanket patterns cover buildings. Like Beach, KC Adams also grew up rarely seeing Indigenous art reflected where she lived. Adams was raised in Selkirk, Man., and describes herself as a social practice artist. "My work is really about social and economic issues that we face," she said. 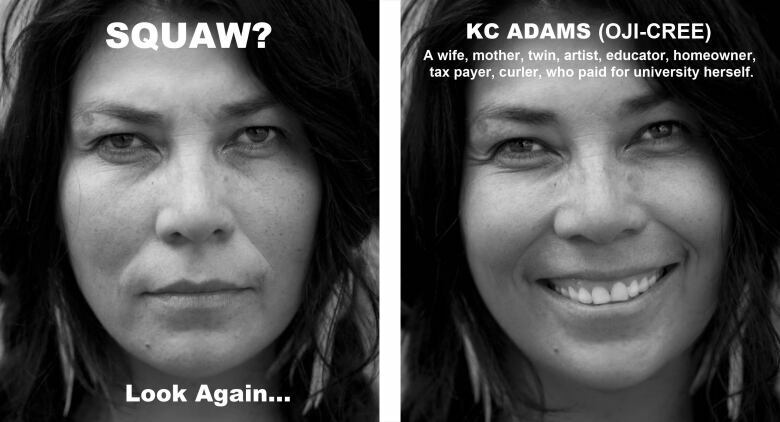 In 2015, Adams started the Perception series — a social media art campaign using side by side portraits of Indigenous people with text underneath. On the first half would be a portrait of an Indigenous person with a stoic face, and stereotypical words underneath. On the other half, the same person would be smiling with a description of who they are. While it started it on social media, the campaign was given a boost with the help of Urban Shaman Art Gallery. The art gallery raised enough funds to put the images on billboards and on buses around the city. The ultimate goal — breaking down stereotypes. "I think there is definitely a desire to understand our culture a little bit more," said Adams. This week, Adams and co-creators Val Vint and Jaimie Isaac will be unveiling a new nine metre tall metal sculpture at the southern entrance of Winnipeg's busiest tourist attraction, The Forks. The sculpture's name, Nimamaa, means "my mother" in Cree, Ojibway and Michif. It resembles a pregnant woman with long hair flowing, looking toward the Red River. "It represents motherhood," said Adams. "She's facing out to the water because she's a water carrier. She's a hopeful sculpture because she represents new beginnings and we hope that people get inspired by her and remember that water is life and that we need to protect Mother Earth." A lot of the Indigenous art pieces that have popped up across the city over the past few years are the result of partnerships between local Indigenous artists and organizations such as Downtown Winnipeg Biz and Synonym Art Consultation. Synonym Art Consultation is an artist-based collective that was founded by Chloe Chafe and Andrew Eastman more than five years ago. "We started [Synonym] essentially to gain accessibility in the arts world," said Chafe. Chafe said collaborating with Indigenous artists has multiple benefits for a neighborhood. "The major piece for us is community activation," said Chafe. "Even if you don't know the history behind the starblanket, it is instantly community beautification, which makes us respect our streets more and uplifts daily living." Synonym has helped create more than 50 public murals in Winnipeg's core. The murals have primarily been in neighbourhoods that have large Indigenous populations. Synonym often hires people who live in the area to work on the large scale murals, giving an added sense of ownership of the artwork. "Not everyone can own artwork in their homes," said Chafe. "So to be able to have these art collections in the neighborhood, they belong to the community."